UniMás is a U.S. based Spanish-language television network owned by Univision. The channel has a significant audience reach in the USA, of approximately 70 million households. The network is ranked as the third largest US Hispanic TV network behind Telemundo. UniMás offers programming that is targeted to a younger US Hispanic audience such as live soccer matches from the Mexican league, novelas and sitcoms. UniMás broadcasts in 1080i (HDTV) and 480i (SDTV) signals and is available on national TV providers such as Dish Network and DirecTV. 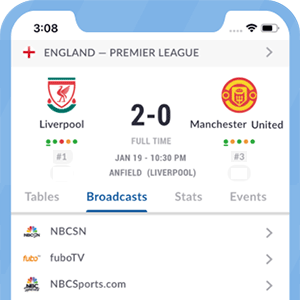 UniMás is also available to watch online or on the go via OTT services such as fuboTV and Sling TV. The channel is available in many key hispanic markets through affiliations with local broadcast television stations. UniMás offers sports programming dedicated almost entirely to live soccer matches and related soccer programming targeting US Hispanics, Latinos and Mexican Americans. Due to its association with Univision Deportes Network (UDN), UniMás combines to broadcast many of the UDN soccer properties on its network. Such competitions and leagues include weekly matches of Mexico's *Liga MX and the MLS (Major League Soccer). UniMás also offers friendly and competitive matches of the Mexican National Team. This summer UniMás will align with Univision Deportes and Univision to offer complete coverage of the 2016 Copa América Centenario being hosted in the USA. *Note: Liga MX matches are limited to those of the following Liga MX teams: América, Chiapas, Cruz Azul, Guadalajara, Monterrey, Puebla, Querétaro, Toluca, UANL, UNAM and Veracruz. UniMás’ programs can be watched via Univisión NOW, an over-the-top streaming service which enables viewers to watch their content without an existing pay television subscription. This service also gives users the chance to replay content on-demand up to 72 hours after the program’s original broadcast. UniMás affiliated TV stations for select US Hispanic markets. Local TV networks affiliated to UniMás. UniMás is available on various other TV providers. For specific local channel numbers, please verify here. *Got itLive Soccer TV does not provide UniMás live streaming. The information provided on this page is simply UniMás soccer TV schedule. Unimas to air 16 Gold Cup 2015 matches live in the USA.